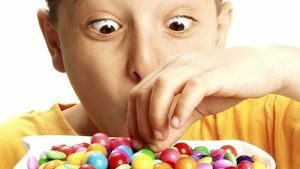 I recently came across this CBC article, Kids Are Becoming Candyholics, and Adults Are to Blame. It piqued my interest because I have often thought the same thing. I’m not exaggerating when I say that everywhere we go — the hair cutters, friends’ and relatives’ houses, even after gymnastics class! — my four and six year old children are presented with sweets by an adult. And more often than not, that same adult hasn’t asked for my consent first — they just go straight to the kids. I have yet to meet a kid who instinctively says no to candy. Clearly the collective mentality suggests this isn’t a problem — a treat here and there won’t kill you. But what these adults aren’t fully appreciating is that it’s not just “here and there.” It might appear that way during their brief encounter with my children, but what they don’t see later on are the other five adults making them similar offers. Unless I intervene, the only thing my children might eat “here and there” is healthy food! But I have to pick my battles. Do I just let it go and compromise what I truly want for my children in order to please other people or avoid making a scene? Do I say yes sometimes and no others, or does that actually confuse my kids more? I believe it’s our responsibility as parents to protect our children and keep them out of harm’s way. Nobody would ever pass judgment over a parent who teaches their children to look both ways before crossing the street. Is this just a more socially acceptable form of being a “mean Mommy” since the child is more likely to die suddenly if hit by a car? This may sound extreme, but the stats linking sugar with chronic ill health and lowered life expectancy are pretty sobering! Should helping our children to foster a healthy relationship with food be any less of a priority than keeping them away from immediate danger, simply because it doesn’t kill them right away? Perhaps we’ve just never thought of it this way. These days, you literally have to go out of your way — in other words, invest enormous amounts of time, energy and patience — to keep sweets away from your kids. Is it possible that this is actually the problem? That as a society we have become so accustomed to fake, processed food at every turn that we look upon those who even try and resist it as the weird ones? Some days I think it would actually be easier to be a hunter-gatherer. They just didn’t have these kinds of dilemmas to deal with. While I do agree that some exposure to sweets is completely harmless, I also feel as though a “healthy exposure” to junk food is a bit of a slippery slope. For those who don’t believe me, just try giving your kids junk “every once in a while,” never giving in to — or becoming frustrated with — the subsequent meltdowns that ensue when you deny their future requests for it. All of this can be avoided by just eating real food. I completely understand how effective it can be to reward children with junk food. Why? Because it works to change their behaviour in the short term. Sometimes desperate times call for desperate measures. Despite all I know and stand for on this subject, there have been days I’ve considered resorting to this. Days when I knew I could end a ridiculous temper tantrum by offering a sweet treat. I’ve been there. I know how hard it is to ignore this low hanging fruit and take the high road that is really in your child’s best interest. But just like anything else, the more you do it, the easier it becomes. Most adults I work with would give anything to snap their fingers and magically be cured of their unhealthy relationship with (even addictions to) food. But what we sometimes fail to recognize is that often these unhealthy relationships begin early in childhood when we learn that we “deserve” treats for our good behaviour. Or simply because we’re children! As soon as we start confusing sweet treats with love, unhealthy physical and psychological patterns are likely to emerge. Our children deserve our unconditional love, time and attention. Our children don’t “deserve” treats (even if they’re Paleo! ), toys and designer clothing. I’ve heard from many parents that their child is the worst eater. In fact, I used to firmly believe I had that child. Until one day when I finally took responsibility for the fact that my four-year-old’s eating habits were the way they were because of me. Because of the food I was choosing to buy and offer to him. Because after he refused his carrots and peas, I gave him Cheerios and Goldfish crackers so he “wouldn’t starve.” These behaviours of mine conditioned my child to be the worst eater. It was a tough pill to swallow that day, but looking back it was the best thing I could have ever done for my picky eater. Now six, he has never once starved himself and thoroughly enjoys all the real food we keep in the house. He is thriving despite his “mean Mommy” never offering him candy and sweets anymore. The biggest thing I’ve learned about my children is how resilient they really are. How given firm boundaries they can be happy and content with the rules we choose to enforce. How in the presence of genuine love and affection, they can still enjoy a meaningful childhood despite being “deprived” of sweet treats at every turn. In the spirit of tough love, I’ll leave you with one final question: Is it your child that wants the candy, or is it you that wants them to have it? At first glance this might seem ridiculous, until you stop to consider the pleasure that youcould be deriving from the experience of feeding them treats. If you’re looking to create a healthier relationship with food for your child, it could be worth digging deep for some insights.